I'm super excited to announce that House of Terrance is now carrying the stunning wearable artwork of African Baroque Textiles Jewelry! You might remember a post I did last February after spending 3 weeks in South Africa. It was on that trip that I met the very talented Colleen Brand who lives in the charming seaside town of Fish Hoek. I had been following her company, African Baroque Textile Jewelry, on Instagram for many months and really loved what she was creating. So when I got to Cape Town I reached out to say hello. We spent a wonderful afternoon looking through her exquisite African beads and fabrics and learning about her life there. I remember thinking how much I'd love to feature her and her jewelry on H*O*T, fast forward 6 months and together we've made it happen! I'm thrilled to carry 3 different styles of the African Baroque Textile wearable art necklaces on H*O*T.
We're stocking the single strand rope necklace called the Solo which can be worn singly or mixed and matched with others. We're also stocking the Duet or double strand necklace. All of these necklaces are lightweight and can be simply pulled over the head to wear. The 3rd necklace we're stocking is the African Moon which fits more like a choker, features charming little Anemone flowers and fastens at the back with a fabric loop closure. 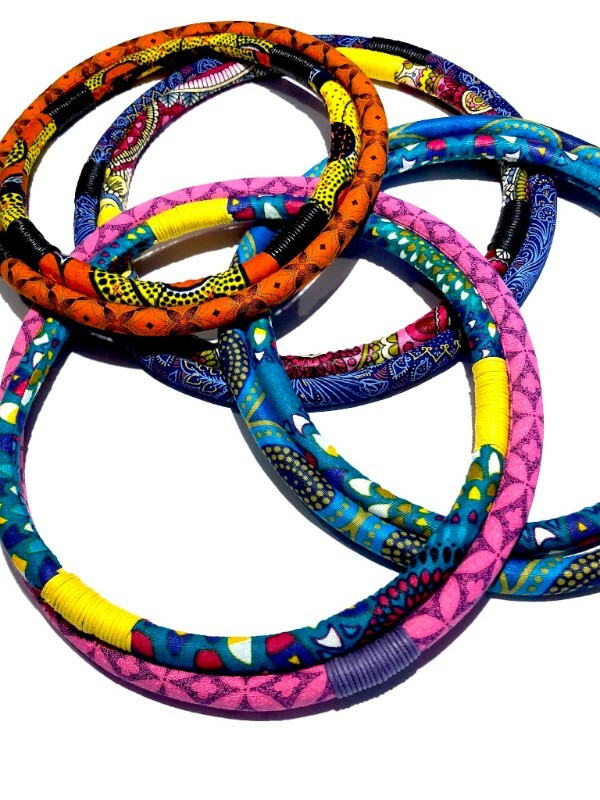 All necklaces are made of 100% cotton shweshwe and/or African wax print fabrics and no two items are ever alike. We think they're the perfect way to add some spice to your wardrobe this fall! Not surprisingly Colleen started in the world of fine art. She became entranced with the gorgeous colors and textures of African handmade beads and textiles created by indigenous people. However, as these micro industries are under threat from foreign cheap mass production, Colleen's dream is for the world to see and love the beads and respect the hands that create them using ancient traditional processes in an earth-friendly manner. "African Baroque adornments are not simply beautiful objects but rather an introduction to the creative, dignified and hardworking, enterprising, craftspeople of Africa." Colleen uses beads from Kenya, Ethiopia, South Africa, and Namibia as well as found and vintage beads from deconstructed necklaces. The gorgeous South African textile shweshwe forms the base of the designs with African wax prints, Kuba cloth, Bogalafini, and Indigo cloth also used. These are integrated with raw silk, linen, velvet, and vintage textiles. Introducing Fashion Artist Airwan Isle Groove!